*PLEASE NOTE: The cost of precious metals is fluctuating weekly. Although prices on this website are being updated on a regular base, they are merely indicative. Contact us for a customized price quotation if you find a set of wedding or clan rings or a piece of jewelry you are interested in ordering. Please do not forget to mention the item number and the exact ring sizes in case you ask for a price quotation for wedding rings or clan rings. 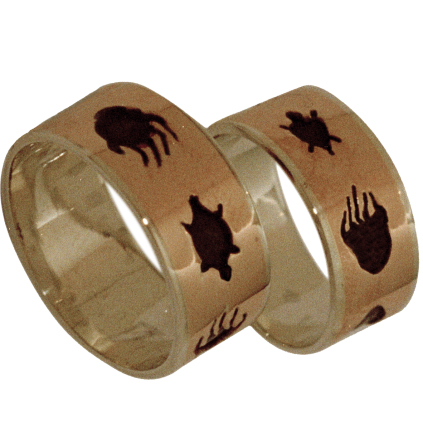 The above overlay clan wedding rings depict the symbols of two of the most prominent and numerous odoodemag (clans) of the Haudenosaunee and Anishinaabe Peoples of the northern regions of Turtle Island – nowadays called Canada and the United States. The Bear Clan people are the warriors, healers, historians, and legalists of the People. The bear clan is called Hodidjioiñi’'g by the Onondowahga (Seneca), Ohkwá:li by the Onayotekaono (Oneida), and Ohkwá:ri by the Kanienkehaka (Mohawk); the name the Anishinaabeg use for the Bear clan is Nooke. Haudenosaunee tradition says that it was an elder woman who gifted Bear Clan people with knowledge of Medicine and Healing. Ancient Anishinaabe tradition has it that Makwa the bear came to Earth to teach te People about the medicinal use of plants and herbs and to gift them with the power of dreaming as a way to get in touch with their curative powers. According to the traditions of both the Haudenosaunee and Anishinaabeg, of all animals, Bear is the closest related to humans. He teaches the People strength and gentleness and not to overpower or intimidate others, unless there is no other choice. Bear Clan members are generally leaders within their community and stand up for their families' best interests. A Bear has two sides to his personality: on one hand he is curious, cheerful, good-natured, and deliberate; on the other hand, they can be quick to anger, because they are sure of their own power, and will defend their family to the death. The Bear clans of the Anishnaabeg (Ojibweg, Odaawaag, and Bodéwadmik) represent at least two of the seven Grandfather Teachings that stem from the time when our ancestors still lived in the dawn Land along the shores of the Atlantic Ocean: Debwewin (Truth), and Aakode'ewin (Courage). Of all Teachings, the virtue of aakode’ewin is deemed especially meaningful, for, as the Elders tell us, being brave is not about being audacious or acting the most daring or mighty, but being brave enough to incorporate all other teachings into one’s life, even if that means standing alone in the community. Makwa was therefore chosen to represent the Law of Bravery and to represent the Warrior doodem, in charge of defense. Bear clan people, therefore, are the police force of our communities and Nation; they are also looked upon as medics, and they are respected guardians of our traditions, and many decision makers and legal specialists have also emerged from the ranks of the Bear Clan. In the Creation Stories of both the Haudenosaunee and Anishinaabe Peoples, the Earth was created on the back of a Giant Sea Turtle. It was there that life began to grow. It is said that Turtle Clan members are the keepers of the land, and gifted communicators and providers of information. The responsibility of the Turtle Clan is to protect the environment, the land, its resources, and the quality of the air and the water for the benefit of the Generations to come. The Onayotekaono (Oneida) name for the Turtle clan is A'no:wál, that of the Onondowahgah (Seneca) Hadiniǎ‘'děñ‘, that of the Kanienkehaka (Mohawk) A'nó:wara, and the Ska-Ruh-Reh (Tuscarora) name for the Turtle clan is Ráˀkwihs. The Anishinaabeg have three Turtle clans: Mishiikenh, Mikinaak, and Miskwaadesi. Mishiikenh represents the Medicine Clans of both Ojibweg and Bodéwadmik; Mikinaak and Miskwaadesi are exclusively Ojibwe clans. 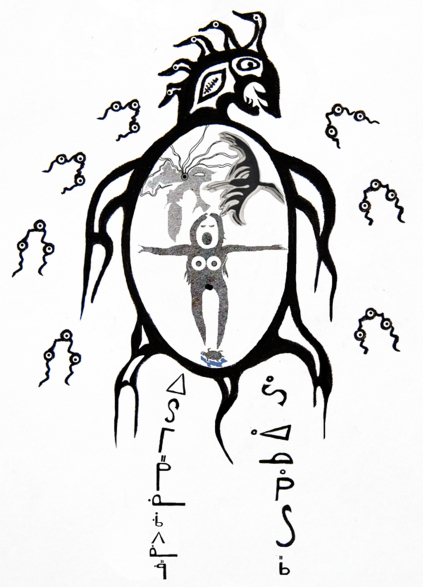 To the Peoples of the Anishinaabeg, Mishiikenh, the mud turtle, respectively Mikinaak, the snapping turtle, are two related aadizoogaanag (spirit grandfathers) who were appointed as the chief bearers of good dreams and ideals from the spirit world, and who taught the Anishinaabeg healing and communication. Along with Miskwaadesi, the painted turtle, they are part of the great Wawaazisii or Bullhead doodem division, a group consisting of clans primarily charged with Teaching and Healing. Turtle teaches the People healing and communication with the Mystery World. Although physically the slowest of all creatures, he/she symbolizes swiftness of the mind and is regarded as a master of communication (of thought). Having served mankind by offering his back as a refuge to the supernatural creator Giizhigookwe (Sky Woman), and by lending his shell for the re-creation of Anishinaabe Aki (the world), the turtle, as a token of appreciation, was endowed with unique powers, enabling him to interchange his physical and incorporeal qualities, and travel backward and forward in time. For this reason the jaasakiidjig, the Midewiwin specialists often referred to as Shaking Tent Seers, and who claim to draw their spiritual healing power from the Thunder Beings, elected the turtle as their patron. Turtle stands for communication and for possessing a quick and agile mind, and Turtle Clan members make it their priority in life to emulate his communal talents and his aptitude of social interaction; some fulfill their tasks in life as healers and thinkers.